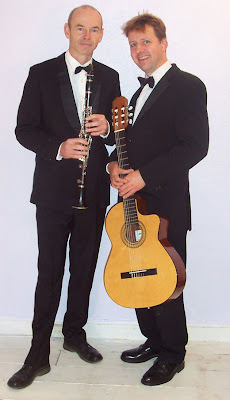 Last night Andy Kirkham and I played at Dunston Hall's brasserie. Dunston Hall is a large hotel, conference centre and golf course just south of Norwich. We used to play there once a month on rotation with some other outfits before the credit crunch. "Jazz every Friday" became "jazz on the last Friday of the month" so now we play there two or three times a year. Our primary function is to look good against the pot plants and décor so DJs and bow ties are mandatory. The volume must be such that conversation flows easily over the music but any gaps are not awkward. The diners in the vast room are hidden from us by screens. We face the entrance so see them as they arrive and when they leave. A few we see as they wander past to get their food. Some are old and shuffling, others are young and preening but none seem immune from attempting a dance step or shimmy as they pass in front of the musicians. (Our smiles were warm and indulgent.) Beyond that our presence is rarely acknowledged. Last night, for the first time ever, we were asked to play 'Happy Birthday'. This is a harder tune than you may think as the melody begins on the dominant and it's easy to end up with a sharpened fourth if one is careless. I have seen otherwise able players come unstuck. But we had practised this. The trouble was, we couldn't remember in what key. Andy was all for doing it in E but that meant six sharps for me on the clarinet. I insisted on Bb - after all, he only had to bash out three chords, albeit without a strap. In the even the party began singing (in Eb) as soon as they saw us approaching so we had to join in. We then played it for them in C - much too low - and have agreed F as a key for the future. I'll learn it in E too as we're sure to have forgotten by next time. Other diners obviously took note and later we blessed an engaged couple and another table's special occasion although I never learned the cause for celebration. No doubt things will return to normal when we go back in October. Now, having seen the photograph, you may wonder what on earth possessed three tables to invite us to play to them close up. But then you're probably sober. Norwich is full of mediaeval churches and as I wandered along Pottergate this morning and heard nine o'clock chime I supposed the sound to emanate from one of them. 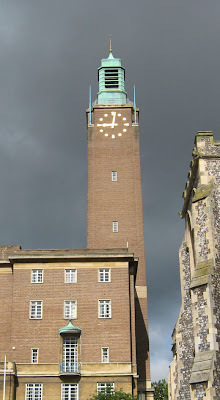 In fact the tolling bell was in the clock tower of City Hall, a 1930s construction apparently much admired by Hitler and complete with prominent leopards doing his trademark straight-armed salute. I have many associations with bells but have never seriously considered campanology. Ever since I damaged the hearing in one ear listening to a rock band rehearse I have found myself very sensitive to loud noises. I have enjoyed hand-bell performances but otherwise keep my distance. And until today I had been unaware of Edgar Allen Poe's famous poem. The closest I had come was Viv Stanshall's wonderful line 'Edgar Allen pot pourri of Eldritch foul imaginings' from Sir Henry at Rawlinson End. But my own favourite memory is of walking up the steps of a friend's house to call on him. I was fifteen and in an artificially-induced state of heightened (or altered or both) awareness. The instant I pressed the button on his door-frame the bells in the church across the road began to peel in those complex and evolving descending patterns. The time it took me to establish what had just happened was long and delicious. Just a reminder that every month I post a (free) music or sound related game to play with other people. You can find it on my playwithsound.com website. This month it's a game called Hide and Listen and its purpose, besides fun, is to develop aural perception. An unexpected insight I've gained from playing this with groups of ten-year-olds recently is the extent of the gender divide at that age. Boys quickly indentified their male friends but were flummoxed when they had to distinguish between the voices of the girls. And vice versa. The only exceptions were when kids with very distinctive accents or adults took part. Rare occasions when a male voice was mistaken for a female caused great hilarity. The rounds where funny voices were allowed were also popular and gave the foreign children more of a chance. Adults, however, never stand any chance in kids' games - at least not the adults I've played with. The theory goes that if you remove one sense then those that remain are heightened. This has certainly been true in my experience. We are very sight dependent animals and if we really want to taste, feel or hear something more fully many of us like to close our eyes. Of course we need to feel safe while we're doing that. I like to use the temporary removal of sight in order to sensitise students to sound. The blindfold is really just to help them keep their eyes closed. However, the trust required may take a few sessions to build up, depending on the size and social chemistry of the group, the circumstances of the workshop and other factors. 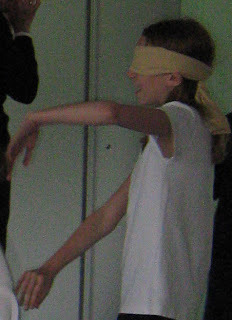 A good game for introducing blindfolds is Leader Follower. 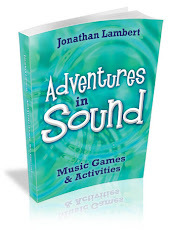 A fuller explanation can be found in my book, Adventures in Sound, (no apologies for the plug - the first in months!) but it involves pairing up, one half of the pair closing their eyes while the other leads them around a space full of obstacles and other people. The 'blind' person doesn't wear a blindfold but just shuts their eyes and the physical contact is very light so s/he can break away at any time. It's essentially a trust building exercise and has applications outside of music. Children need to experiment and it can take a while to get some of them used to notions of responsibility for someone else. With boys especially there is often a strong urge to 'get your revenge in first'. When it comes to wearing blindfolds, some people really don't like to and it is unwise to insist. They are really just a prop, a way of making it easier to keep the eyes shut, and any exercise that uses them can be played without them. You can rely on the rest of the group to call 'cheat!' if anyone peeps. It is very important to establish strict ground rules regarding the use of blindfolds. In particular, anyone wearing one is very vulnerable and this fact should not be taken advantage of. No physical contact, no creeping up and suddenly shouting in their ears. This sort of behaviour, annoying normally, is far worse when suddenly unsighted. In general the blindfolded person is in a passive role and it is natural to look after them. But there is a wonderful game called Bat Moth (also in the book) that I learnt from a man who is very into tracking skills. In this game the blindfolded bat is the aggressor and it is counter-intuitive not to wish them a small amount of harm if you are a moth. It shouldn't be the first blindfold game you play. In my experience children love to wear blindfolds. It imbues a session with a sense of theatre and they enjoy the change of sensory emphasis from sight to sound. 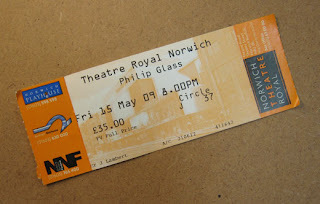 The annual Norfolk and Norwich Festival is taking place at the moment and last night I went to the Theatre Royal to see Philip Glass perform some solo piano works. As you might expect for such a big name the audience was an even mix of people who were into his music and others just curious as to what the fuss was all about. To the untutored ear the music is much of a muchness and I found my thoughts beginning to wander as the same note patterns and chord sequences seemed to be reworked in successive pieces. Not being a piano player I had never attempted any of his work but watching his fingers move I realised this was music composed by and for the piano. Add or take away a finger from either hand and it would all sound very different. Change from a piano to an electric guitar or a bassoon and he would have made another music altogether. And then I couldn't help thinking that although he's not a bad player himself he's hardly a concert pianist and that perhaps someone else might have performed it all with more technical accomplishment. And somehow I don't think he would disagree. At some point I realised I had been immersed in, was still immersed in, a wonderful feeling of calm introspection brought about by the music. And the performer's demeanour was so warm, matter-of-fact, unassuming and yet tremendously respectful of his audience that I was enjoying that connection to the music that only the composer can give. The concert wasn't about technique, it was about intent and communication. At the end he did the obligatory encore; that part of the set that is really the final number but which is saved for after the applause because that's what the audience expects. After further enthusiastic applause he played what I believe was a genuine encore, an extract from the soundtrack to The Thin Blue Line. I am not sure how well be had prepared for the piece. It ended abruptly with a loud staccato chord from nowhere as it to say 'enough's enough'. Last week's trip to Wells was an opportunity to use my Dead Kitten (see post for 20th April) in conjunction with my Zoom H4 recording device. I wanted to interview as many children as possible about the work they were doing - art based inspired by Andy Goldsworthy. Although there'll never be time to turn the photos and sound files into a son et lumière production I find it very interesting to hear what the kids have to say. Having the microphone usually focuses their minds and is good experience for them. I can also assure my paymasters that I am gathering 'evidence'. Playing back the sound files, the Dead Kitten seems to have done its job well. It was fairly still in the trees last week but it doesn't take much of a breeze to interfere with the proper working of a sensitive microphone. Tomorrow is the big test: Mundesley beach, wind from the east, recording seaside sounds as a backing for some poetry. The poems in question have been written by children of seven and eight and I'll be recording them reading them too - but indoors. I've just finished a busy but rewarding week in which, with other artists, I accompanied a bunch of kids to Wells-next-the-Sea. Two groups, two consecutive days. The main thrust of the visit was to introduce the concept of land art, as made famous by Andy Goldsworthy, and provide a great location in which to try it out. 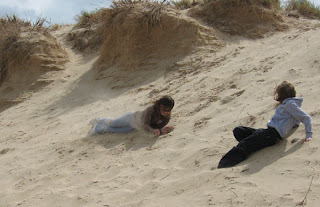 While half the children were given a start on this in the pine woods, the other half were taken off to a sand dune for a short game of adjective charades, using the dune as their stage culminating in a descent in the manner of the adjective they had chosen for us to guess. The adjectives were along the lines of happy, angry, sad etc. 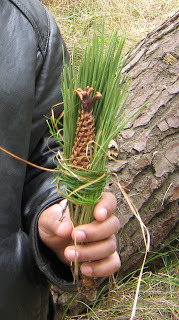 After this they went back into the woods to learn all about land art. Friday, back at school, was a taster day in which each of four artists gave a session to a quarter of the year group in turn so all the kids got to do some movement, some music, some book making and some kite making. Time was very short and of the two afternoon sessions, fifty minutes long in theory, the first was cut short by fifteen minutes because of registration. It felt a rush to get through to some meaningful work with instruments but I wanted to build on the adjective charades by adapting a game of Colour to five emotional states: excited, happy, sad, irritated and angry. We went through a round of names then played Hide and Listen (a big hit and May's Game of the Month) and a couple of games of Detective for familiarisation with the instruments I had provided. Finally I could split them into four groups of three or four children and flash them the name of an emotion written on a card. Then they could choose their instruments, compose their piece and finally perform to the others, who had to guess which emotion was being portrayed. As expected, one or two children had to play a particular instrument at all cost, even asking to change the emotion to make it easier to incorporate their vehicle of choice. (Imagine trying to convey anger on a delicate (non hammer-) dulcimer.) 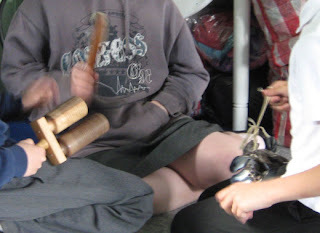 But in general I was impressed by how many children preferred a mundane instrument, like a stick tambourine or coconut shells, over something more exotic because it was better suited to the mood they were expressing. 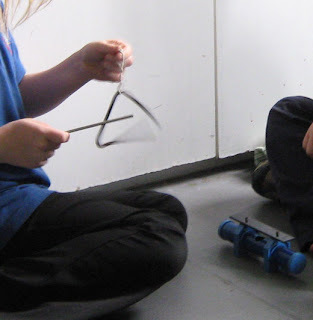 I have mentioned the sweet shop syndrome in the past and I think that had all the children had better exposure to the instruments in the past all their choices would have been driven by the requirements of the sound they were trying to create. But that's the nature of a taster session - and a taste is no substitute for a full meal. I love those moments standing in the shower just a after it has been turned off. The water continues to fall from me, small droplets pattering irregularly into the bath. From the rose comes a large drop, and then another and another. I hear their impact, a regular pulse against a random chatter. In a school where I have been working a pond has just been filled in. Many frogs and spawn relocated, newts faring less well, their dead bodies scattered on the ground, saddening the children. A wooden fence surrounded the pond and we plan to make it into the xylophone part of an outdoor instrument, inspired by Will Menter. My friend and co-worker Abie studied his work at art college. This included a telephone interview in which they discovered a shared love of drips. (More on Abie's drips another time.) When I heard this I was very pleased to share my love of drips too. For the outdoor instrument I would like a drip component so it can play itself in the rain. 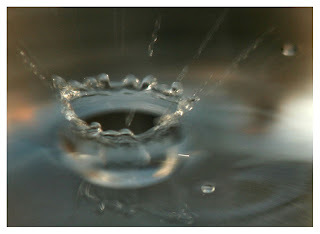 No matter how regular the pulse one can never predict the exact sound of the next drop. Every month I post a new game on my website. May's game of the month is called Hide and Listen. As you may already have guessed, it's a sonic variation on Hide and Seek. It can be played indoors or outside and is suitable for all ages. It's a versatile and highly adaptable game so get playing. And please let me know all the adaptations you come up with to make it more challenging for more able groups.